1. 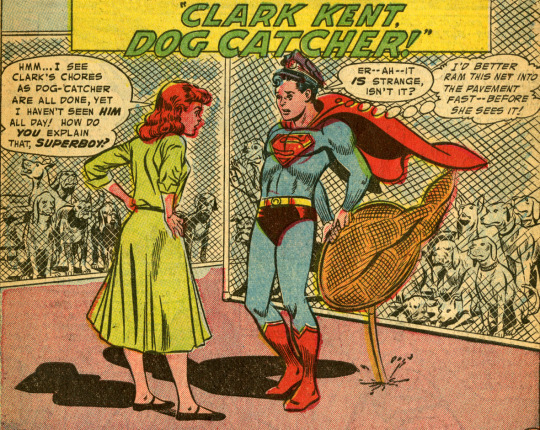 Clark Kent, Dog Catcher! Could any story, no matter how silly, live up to that title?!? Let’s see! The drawing of Superboy in the splash page wonderfully conveys his awkward nervousness with Lana Lang’s accusations. (Superboy is so cute on those rare occasions when he seems vulnerable!) Lana must really have him flustered though. His idea to ram his net into the pavement is terrible! That’s just going to draw more attention to it. Doing nothing would be better than that, Clark! Let’s hope things improve. Suddenly Superboy’s services are needed so he blows coal dust over Lana’s sunglasses so she doesn’t see him slipping away to change. I know he’s super and all but I’m VERY skeptical this would work. 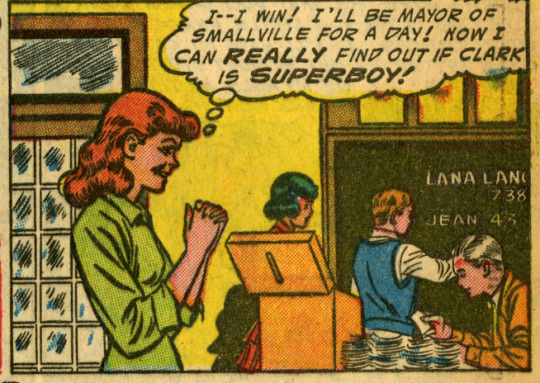 Lana wins the election and her first thought is to use her office to find out Superboy’s secret identity. Talk about power corrupting! 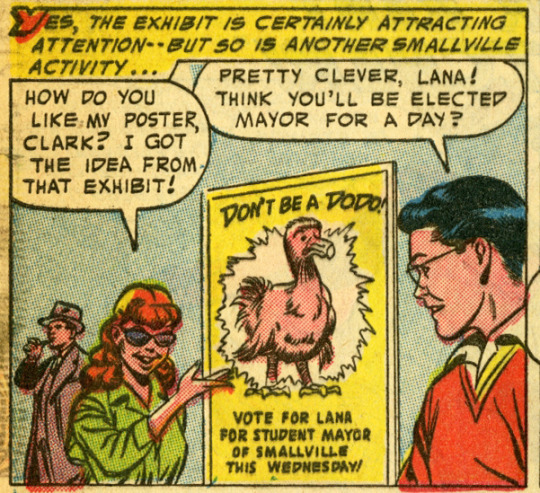 Lana appoints Superboy Chief of Police and Clark dog catcher and proceeds to schedule them to be in different places at the same time to see what happens. She may not know much about dinosaurs but she can be clever. 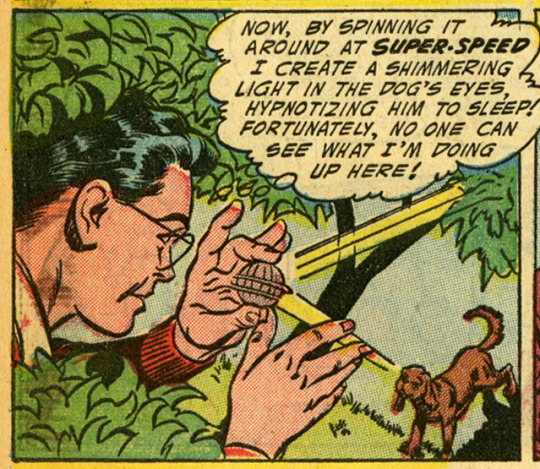 One of Clark’s first undertakings as dog catcher is to hypnotize a dog with a spinning coin. Apparently one of Superboy’s powers is making implausible ideas actually work. Meanwhile, as Chief of Police, Superboy volunteers to be the target for target practice—resulting in this adorable panel. It’s hard to imagine him letting his guard down like this when he grows up to be Superman. Lana, alas, is outwitted by Clark/Superboy all day and her plot to uncover his secret identity produces no definitive results. In a last ditch effort, Lana throws a banquet for all the city’s officers and arranges for Clark and Superboy to sit on either side of her. 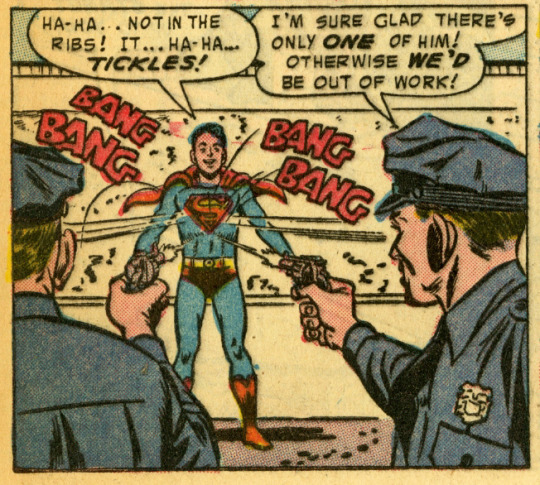 Clark is a no show, but Superboy has an explanation: Clark has been arrested! Yes, Lana it’s all a waste of time—just like this story (jk). I wish there had been less of Lana and her schemes and more Superboy tickling. A criminal mastermind concocts an elaborate plan to uncover Superboy’s secret identity. His research has narrowed down the suspects to four boys with unusual abilities—four boys that we definitely know are NOT Superboy. So why even read the story? Superboy’s secret isn’t in any danger. Hmmm. Marko, the man behind the sinister plot, arranges for the first three boys to encounter life-threatening accidents. He figures if they remain unharmed, they must be Superboy. But Superboy manages to save all of them. Not exactly what Marko had in mind, but Superboy saving the three boys—and being in the same place at the same time as them—convinces him that the last boy, John Crandall must be the Boy of Steel. 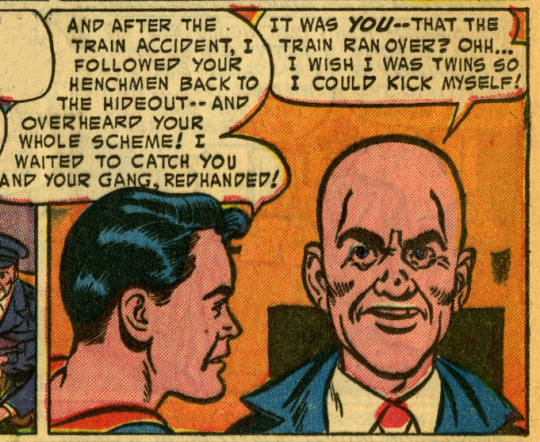 Marko’s thugs push Crandall in front of a speeding train but Crandall survives, seemingly proving that he’s Superboy. Marko’s gang puts Crandall under surveillance, committing crimes when they are sure Superboy won’t be around. However, the scheme fails when Superboy busts them pulling off a robbery. It turns out, after the accidents involving the first three boys, Superboy disguised himself as John Crandall as a precaution. It really was Superboy who got pushed in front of the train. This story, like many superhero stories of the time, revolved around a secret identity—but this time that secret is never actually in jeopardy. Even Lana Lang has changed her tune from the previous story and has no suspicions about Clark at all. 3. The Boy Oracle of Smallville! It’s Good Samaritan Week in Smallville and Superboy has a list of urgent deeds to perform all over the world. 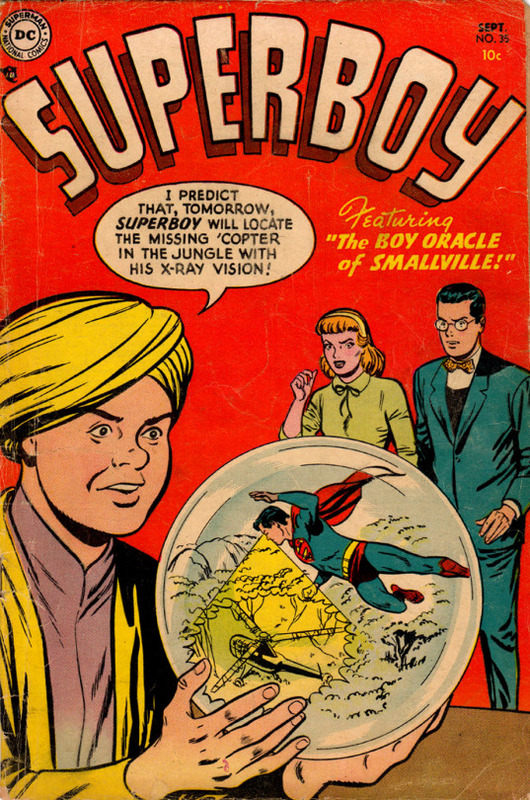 Clark Kent’s schoolmate Stan Holton uses a crystal ball to predict the whereabouts of Superboy as he flies to different parts of the globe. After three successful predictions, a gang of criminals (led by “Sure Thing” Doone!) decide to strike when Superboy is predicted to be away. Their “big job”? Smashing a statue by throwing it off a cliff in order to collect the coins inside. Superboy needs to find some smarter criminals. I mean, how much did it cost to rent that tank? 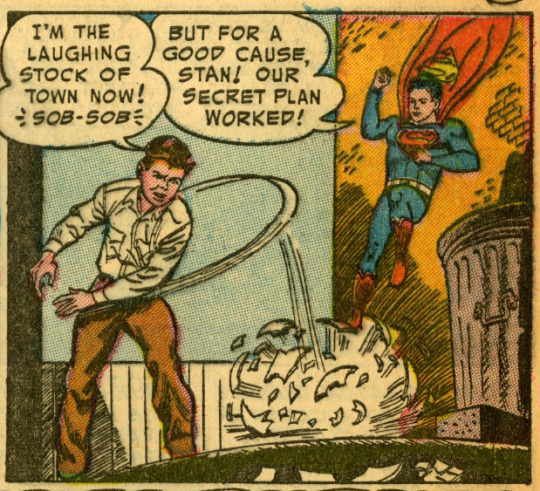 In the end, it’s revealed that Stan and Superboy set up the whole prediction scam to entice “Sure Thing” into action. In spite of helping Superboy, when Stan momentarily looks like a failed “boy oracle” he kind of acts like a baby. You’d think when Superboy was looking for an assistant, he would choose someone a little more mature.